Inspired by the success of a minimalist collection of 300 Series, the London design studio Uniform Wares has released a new version of the 302 hours of Series with modern finishes and high-quality leather straps (the previous model were completed urethane straps). Watch a new series made in an unobtrusive combination of classic and sports an elegant styles are available in several versions – in stainless steel, steel with black PVD-coated finish, or rose gold. Case Diameter – 42 mm, thickness – 11.25 mm. 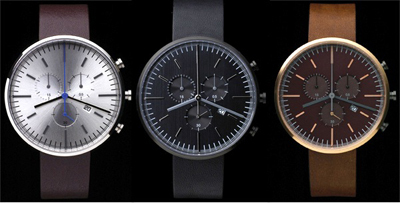 Laconic dial is available in three colors – silver, black and dark tobacco. It contrasts stand out oblong hour markers, minute scale and chronograph counters (seconds counter – at the bottom of the dial, a 30-minute – from left, split-second – right). Hours, minutes and seconds show the central arrow, date – a small window located at position “4” clock. Watch 302 Series are based on high-quality quartz mechanism ETA 251.471. Waterproof new models can descend to a depth of 5 ATM (50 meters). Cost – 620 £ (about $ 975) including VAT.